A massive shout out to Dj Center, Push The Fader and Giant Step Radio for highlighting one of my tracks from my upcoming release (which should be dropping very soon, wrapping everything up as we speak). Check out the show it features many more great artists throughout and much more hotness! In the words of Kool Moe Dee: “Turn It Up”! Bing Ji Ling, DJ Deckstream feat Mos Def, Dj A-Ski, Joy Jones, Femi Kuti & More! Thursday Nite LA…My peoples is at it again..Pt2..These are some truly solid cats throwing a really great party..please support! No frills..I promise u! We have assembled a collective of creative spirits to come together to create a fresh new energy not seen in LA. Featuring special surprise guests and musicians as part of the HOUSEQUAKE. New talent, too, are encouraged to come join us on stage during the open mic sessions happening at every event! This week’s Musical guests are LA’s own Rhett Frazier Inc. and Chase Allen… bringin’ the heat with that brand of FUNK that just puts that *ss in motion! Not to be missed…don’t be sleepin’! Chase Allen… Chase Allen’s music is R&B and soul with the energy and catchiness of Maroon 5. The tunes are definitely radio-ready, although some, like “Who the,” where Allen asks, “Who the F- do you think you are?,” may not exactly be radio-friendly. Be that as it may, the songs are so strong and the melodies so memorable, especially “Lying Awake,” you’ll have no choice but to sing and dance to this funky white boy’s beats. We also are having our OPEN MIC SESSION (sign up at 9pm) —singers, mcs, instrumentalists, dancers welcome! Doors 9pm — Only $5!!! Can’t be beat..! Support the artistry..support the genre bending music MOVEMENT…for more info please email us at: 5thstreethousequake@gmail.com..be there every last sunday of the month! Peep the my latest review on the BSTC album at Nu Soul Magazine! 03|15|09: Its SLY’s Birthday Party! Pt3! SLY STONE wants to celebrate his birthday with you. Yes you! And he wants you to come dressed in the appropriate attire: 60S/70S THEME…requested, but not required. And lots of other goodies and surprises. 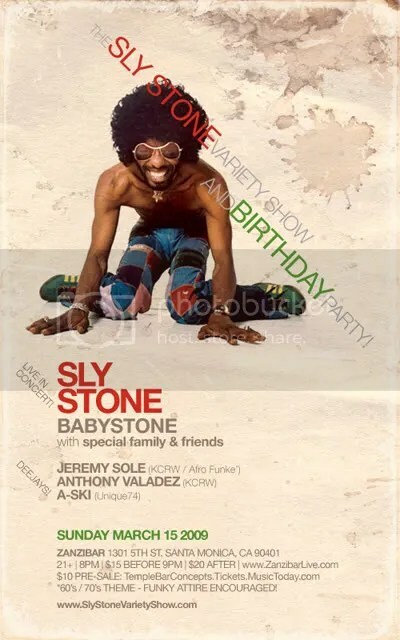 This may be the last of the infamous Sly Stone Variety Show for a while and it’s his birthday to BOOT! Who else can say they went to Sly Stone’s birthday party?? ?…so you don’t want to miss it! $10 LIMITED RECESSION PRICED PRESALE!!! Check out my latest review on the new India Arie album, courtesy of our friends at Nu Soul! I’ve been cranking this mix all week in my ipod, the lovely Lotuspetal blesses us in this week’s feature. Turn this up during your powerwalks. This is a cat that i’ve have had the pleasure of collaborating with on numerous occassions and is one of of the most fiercest Dj’s i’ve heard on the decks who never ceases to surprise me as an artist. Dj Center has been putting in work on his latest for quite some time and is ready to share with the masses. You are in for a treat, please enjoy the latest. To download the latest tune from Everything In Time, featuring the lovely stylings of Ms. Samia Farah. All for free for right now, tell a friend!